In 1975 Aqueduct Racetrack introduced the first and only winterized track in New York State. The one-mile inner track, with 4-1/2 percent banking on its two turns, allows Aqueduct to continue the sport of thoroughbred racing through the coldest months of the year with few cancellations. Located in New York City's borough of Queens, Aqueduct is home to winters that produce unfavorable track conditions for racing. Before Aqueduct opened this state-of-the-art facility, winter racing in New York was unheard of. In January and February of 1977, severe wintry weather created soft spots between the six-furlong and seven-furlong poles on the main track. Because of this, the winterized inner track was used almost exclusively from mid-winter through the month of April. In fact, the 1977 Wood Memorial was only the sixth race of the year that was run on Aqueduct's main track. On the afternoon of April 23 the Wood Memorial was the only race of the day that was run on the main track. The track proved to be dull, deep, and loose. Lack of use certainly played a part in the slow condition of the main strip, but there was also the additional factor of dryness. Track superintendent Joe King had been hoping for rains to settle the surface, but the prior weeks had been dry. Rain was finally in the forecast for the stakes day of April 23, but held off until the following day. Had they come, the predicted rains for that Saturday morning would have helped tighten the surface for the Wood Memorial, making track conditions less slow and tiring. But that was not to be. Instead, Seattle Slew was presented with another challenging obstacle to overcome on his road to becoming history's only undefeated Triple Crown champion. Racing over a very unfamiliar and uniquely tiring surface, a surface he had never even trained over, he would be asked to prove again that he could win around two turns at 9 furlongs. If Slew could show greatness again, he would emerge unbeaten and surely be the odds-on favorite for the Kentucky Derby, just two weeks ahead. On March 31 Seattle Slew had left the confines of Hialeah in south Florida and headed north to his home base at beautiful Belmont Park. Upon arrival, Slew was given a rare honor when the New York Racing Association assigned him to the prestigious Greentree Stable of John Hay (Jock) Whitney. The primary trainer for Greentree Stable was John Gaver. Mr. Gaver had trained 73 stakes winners and four champions during his long tenure with Greentree. Mr. Whitney and Mr. Gaver had so much respect for Seattle Slew that they personally requested he stay in their stable. Mr. Gaver was vocal in expressing his opinion to the Slew Crew that Seattle Slew was the most outstanding thoroughbred colt he had ever seen. Billy Turner had two main objectives in mind when considering the Wood Memorial. He had witnessed Slew's explosive display in the Flamingo Stakes first-hand, and he wanted Slew to run a race in which he relaxed and was more accepting of competition. He also wanted Slew to have a comparatively easy race, one in which he didn't have to expend a great deal of effort. He certainly got his first wish as Slew relaxed beautifully, setting moderate fractions while accepting challenges along his flank. His second wish was not as easily accommodated, as the track surface was very deep, causing Slew to work harder than expected in dominating what turned out to be a very tough race. After the Flamingo Stakes, Turner had backed off a bit on Seattle Slew's training. The Slew Crew were mindful of not overworking the colt on the road to the Triple Crown, knowing that the grueling five-week span of classic races would be taxing enough. In addition to that, the weather conditions at Belmont Park and throughout New York were frigid, with considerable amounts of snow and ice. That made for conditions that were not ideal for training Seattle Slew aggressively, even if the plans had been to do so. After the Champagne Stakes in 1976, the Taylors, Jim Hill, and Turner had mapped out plans for Seattle Slew's three-year-old campaign leading to the Kentucky Derby. "The plan was to go to Hialeah and certainly run in the Flamingo, as we did," recalled Karen Taylor. "Hialeah turned out to be such a pleasure. It was just a great place for Slew and us to be. And then our objective was to go back to New York, because that was home to us and Slew. He loved Belmont Park so much and we knew the right thing to do was get him back there to feel at home in the environment that he loved. The weather didn't necessarily cooperate for training, but Slew loved that wintry weather and he was so happy to be back at Belmont Park. That was our thinking in choosing the Wood Memorial as his final prep for the Derby. It was just a short van ride from Belmont over to Aqueduct. "The condition of the track at Aqueduct was a concern, along with the fact that he hadn't had a chance to work over it. But he handled it very professionally. There was no doubt that he disliked that racing surface. He hated it. But because he was the champion that he was, he dealt with the surface and actually produced an outstanding performance over it." In truth, the effort was spectacular and perhaps one of Seattle Slew's most underrated races. The slowness of a track is always hard to put a measure on when very few races are run over the surface. But during that spring there were horses shipped in to Aqueduct from Florida and California that had been sprinting six furlongs consistently in the vicinity of 1:09. On Aqueduct's main track they ran the same distance in 1:12 and change. That type of differential is an indication of the sluggishness of the racing surface. When some critics of the era saw Seattle Slew's final time of 1:49 3/5 for the nine furlongs, they were quick to jump to conclusions that something was not quite right with Slew. One of the more vocal critics, who will remain nameless here, declared happily, "Take your bankroll to Kentucky. This horse can be had." Many of these critics were then and still are so enamored by speed figures that they place too much emphasis on them. Underestimating track conditions, pace scenarios, the ability of a horse to respond courageously to challenges in the stretch, and the quality of competition that a horse has faced is commonplace for them. The competition Slew would face in this event was a notch below that which he had been facing, and the defection of Clev Er Tell was a main reason for that. Clev Er Tell, a grandson of the legendary Round Table, was a multiple stakes winner and highly-touted by experts. He had been victorious in the Arkansas Derby and Louisiana Derby, a race in which he bested Run Dusty Run. Prior to that, Run Dusty Run had defeated Clev Er Tell in the Louisiana Derby Trial Stakes at 1 1/16 miles. Unfortunately, Clev Er Tell was injured during a gallop at Belmont Park on April 20 and was forced to withdraw from the Wood Memorial. He suffered a chip fracture in his left knee and was taken out of training. The entire racing world is at loss when such things occur. It would have been very exciting to anticipate and witness Seattle Slew's reaction to another talented opponent and the manner in which he would have responded to the challenge. Long considered a major stepping-stone in the New York route to the Kentucky Derby, the Wood Memorial Stakes had already been won by nine runners that were also victorious in Louisville. Seattle Slew's victory in both races marked the first time that the Wood Memorial and Kentucky Derby 'double' happened in three consecutive years. Foolish Pleasure and Bold Forbes had won both races the previous two years. Seattle Slew's rivals for the Wood Memorial included Catalan, Iron Constitution, Papelote, Fratello Ed, and the Darby Dan Farm entry of Sanhedrin and Winterlock. At post time Seattle Slew was the overwhelming odds-on favorite at 1-10. Wearing saddlecloth 5 and breaking from the sixth slot in a field of seven, Seattle Slew came away from the gate in good order. Sanhedrin came out running along the rail, as did Catalan, to the inside of Slew. They led briefly, but Slew's terrific early speed soon took over and he grabbed the early lead while cutting the corner on the first turn. Fratello Ed broke sharply to Slew's outside and showed good speed while angling in along with Slew on the first turn to be in second position, one length behind. Along the early part of the backstretch they maintained position with Winterlock third along the rail and Catalan fourth. Shortly thereafter Fratello Ed and jockey Ruben Hernandez decided to press the pace aggressively and moved up quickly alongside Seattle Slew. The two went head-to-head for more than a furlong. Winterlock was a close third along the rail, trying to force the pace for stable mate Sanhedrin, who was content to run last throughout the backstretch. The fractions of :23 4/5 and :47 4/5 were moderate, and actually slow for Seattle Slew, but jockey Jean Cruguet had him relaxing beautifully as requested by Turner. 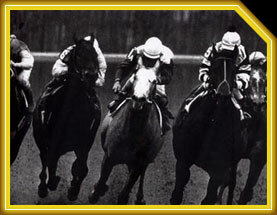 On the far turn Seattle Slew took hold of the sluggish racing surface and began to pull away from the field. Winterlock moved up to take over second position and Fratello Ed began to drop back, a victim of trying to pressure Slew on the tiring strip. Around the far turn and into the stretch Hall of Fame jockey Angel Cordero, Jr. and Sanhedrin made a big one-run move to the far outside. In upper stretch, Seattle Slew had taken command with a six-length lead and Iron Constitution was challenging Winterlock for second place with a run along the rail. Sanhedrin was gaining ground in a furious rally and took over second position by mid-stretch. Seattle Slew coasted home from there, never touched by the whip, completing the mile and an eighth in 1:49 3/5. His margin of victory was 3 ¼ lengths over Sanhedrin, and 7 ¾ over third-place finisher Catalan. Sanhedrin was impressive in rallying strongly on the far turn and throughout the stretch over the cuppy surface. Cordero was encouraged by his mount's effort. "Any horse that finishes second to Seattle Slew deserves to go to the Kentucky Derby," Cordero asserted. "Seattle Slew won mighty easily, but my horse was running." Sanhedrin did well enough to convince his connections to send him to the Kentucky Derby, where he ran an outstanding race to finish third to Seattle Slew. However, Jorge Velasquez was his rider at Churchill Downs because Cordero opted to ride the talented For the Moment in that classic race. After the Wood Memorial, both jockey and trainer expressed their happiness with Seattle Slew's effort. "The colt handled well, relaxed, and ran comfortably with that other horse (Fratello Ed) next to him," said Cruguet. "He doesn't have to run the way he has in the past, take off from his field. He was never really pressed, and when I asked him for a run at about the three-eighths pole, he took off. I didn't have to even take out the stick." "I was very pleased," admitted Turner. "He relaxed. That keeps him closer to his competition, but it gives his rider a lot more horse, if he needs it. He's getting tougher and his competition has more and more of a problem." On the following Wednesday, April 27, Mickey Taylor and the Slew Crew took their Champion to Louisville, Kentucky to begin preparation for thoroughbred racing's most famous race. It certainly was a commendable achievement to be bringing Seattle Slew into the Kentucky Derby as the first undefeated horse since Majestic Prince in 1969. But perhaps the biggest compliment that Seattle Slew received was from Hall of Fame trainer H. Allen Jerkens. Over the years Jerkens earned the reputation of "Giant-killer" because horses he trained had upset champions Kelso, Cicada, Buckpasser, Secretariat, Riva Ridge, and Forego, among others. When the media asked Jerkens after the Wood Memorial why he hadn't entered a horse to try to upset Seattle Slew, the reply he gave exuded respect. "The reason is because I don't have a horse that can run with him," said Jerkens. "Seattle Slew has no faults."